This is sixth (6th) in a series of articles by Bob Whitesel, D.Min., Ph.D. (12/23/16) introducing the 7SYSTEMS.CHURCH and which first appeared in Church Revitalizer Magazine. This sixth installment of how to turn around a church, like the previous installments, is based upon the most comprehensive study of churches ever conducted in North America: The American Congregations Study (Hartford Seminary, copies available at www.FaithCommunitiesToday.org). Every church has some degree of conflict. But “severe conflict” is defined as when opinions are so opposed that even in times of emergency the groups will not work together. A different type of tension is “dissonant harmony,” a term coined by Starke and Dyck in their groundbreaking research on church splits. They found that while all churches have a degree of disagreement, if people overlook disagreements to work together for the common good when necessary, there is harmony with some dissonance. To find out if you have “severe conflict” or just “dissonant harmony” ask yourself the following four questions. 1. Does your church have a guiding vision or mission which most of the people work toward? 2. Do committees, choirs, Sunday School classes and teams focus mostly upon finding the good in others (inside and outside the church)? 3. When unexpected challenges occur, do the people pull together for church survival? If you said yes to three out the four, then you probably have “dissonant harmony.” If so, you can unite the congregation around a turnaround mission/vision. Most church leaders will tell you conflict is poorly addressed in the church. Having perused libraries/bookstores for decades on leadership, my hunch is that conflict resolution is the category with the fewest books published. Yet every church leader knows that conflict resolution is a key part of that leader’s job. 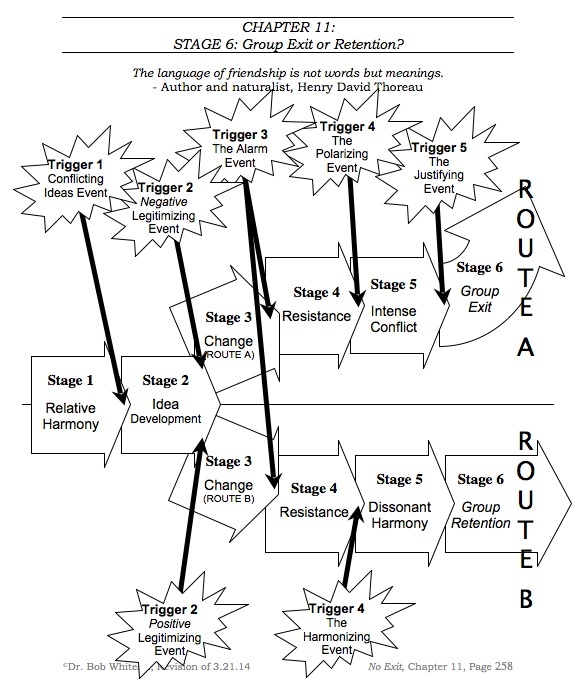 But in conflict resolution literature you find that there are two simple and basic principles in almost all conflict resolution strategies. Here they are. First, don’t get in the middle as a go-between or so-called peacemaker between the factions. Church leaders are often inspired by Jesus’ lauding of the peacemakers in Matt. 5:9. Leaders interpret this as a “go-between” or “diplomat” between warring factions. But the Greek does not carry an idea of “go-between” but rather, “keeping aloof from sectional strifes and the passions which beget them, and living tranquilly for and in the whole.” Starke and Bruno found that go-betweens are also usually blamed for resolution failures, because they are not perceived as correctly communicating each party’s perspective. Both sides take aim at the so-called peacemaker who is then often pushed out of the organization. Second, get the disagreeing parties talking directly to each other. Surprisingly, this is the central component of almost all conflict resolution programs. Only when warring parties meet face-to-face to hammer out a compromise, does resolution result. It means getting people with differences to sit down together and tasking them to come up with an amicable solution. The leader makes it the duty of people with differences to come up with a plan that meets both factions needs. What if conflict can’t be overcome? In some churches conflict has been so severe, for so long that compromise may be impossible. But we have a scriptural example to follow when conflict is so severe it may be better to part ways. We see this in Paul and Barnabas’ disagreement about taking John Mark with them on their second missionary journey (Acts 15:36-39). John Mark had accompanied them on the first journey, yet left midway and Paul seemed to feel it was because of his lack of commitment and perseverance. Barnabas, whose very name means son-of-encouragement, undoubtedly saw the potential in John Mark (after all John Mark would later pen the Gospel of Mark) and urged Paul to let him come along. The scriptures indicate that between Paul and Barnabas a “sharp disagreement” arose, which in the Greek literally means “incited … to anger.” The end result was that Paul and Barnabas agreed to go on two separate missionary journeys where twice as much ministry took place. It may be that conflict in your church is so severe and so historic, that only by parting ways can both organizations be revitalized. Even after a church split, I have found those who remain are usually more open to change. Without the emotional disagreements and historical baggage of the factions in their midst, churches that go their separate ways can often subsequently be revitalized. If you are in dissonant harmony, continue to take the focus off of differences and get the focus back upon overarching goals. But, if you are in severe disunity then agree to disagree, parting ways if necessary. Use the questions and tools in this article to help. by Brian Fielkow, Entrepreneur Magazine, 7/23/18. … 20/60/20 has no scientific basis. It is to make a point. Whatever the number is — 20 percent, 5 percent, 1 percent — most organizations have some employees who may never fit the culture, and your job as a leader is to either bring them fully on board or weed them out. by Bob Whitesel D.Min., Ph.D., 11/02/17. An exercise to understand how to handle new ideas. I created an exercise (at this link) to help colleagues, students and clients identify how they should respond to people who bring new ideas to them. According to research by Dyke and Stark when a leader or a person in power gives even slight encouragement to “change proponents,” they will usually run too fast with the new idea and polarize the congregation in the process. The key when someone brings you a new idea, is instead to “Go Slow, Build Consensus and Succeed” (read an overview in the chapter by that name in Preparing for Change Reaction). You can also read more about how this happens in Staying Power: Why People Leave the Church Over Change What You Can Do About It, Abingdon Press) as well as an excerpted short introduction from on it from my book “Preparing for Change Reaction: How to Introduce Change in Your Church (Wesleyan Publishing House) at this link. The answer it is not as simple as many think at first view. That is because a negative “legitimizing” event is not the same as a negative event. Option 1: Pastor H tells the congregation the church is going to implement Sunday evening small groups. Option 2: Pastor D tells Pastor H he must be firm and forceful with the congregation. What happens differently in a negative “legitimizing” event is that some person “legitimizes a new idea” and as a result the person wishing to implement the new idea moves too quickly. Pastor D “legitimized” the idea in away that would result in Pastor H moving too quickly and having a negative outcome. So this was a “legitimizing” event that resulted in a negative outcome = negative legitimizing event. Both Option 1 and Option 2 were negative events. But, only Option 2 was a negative event where someone “legitimized” the idea. And, the person pushing for the idea (in this case pastor H) moved to quickly. Option 2B: Pastor D tells Pastor H he must slow down, build consensus and even listen to the naysayers before he implements his new idea about small groups. This is a important point to remember when people come to you with new ideas… because their success often depends on how you react. For more info see Preparing for Change Reaction: How to Introduce Change to Your Church, by Bob Whitesel 2010. The figure is from Staying Power: Why People Leave the Church Over Change What You Can Do About It, Abingdon Press, 2003, p. 177). Bruno Dyke and Frederick A. Starke, “The Formation of Breakaway Organizations: Observations and a Process Model,” Administrative Science Quarterly 44 (Ithaca, NY: Johnson Graduate School of Management, Cornell University, 1999), 792-822. Bruno Dyke and Frederick A. Starke, “Upheavals in Congregations: The Causes and Outcomes of Splits,” Review of Religious Research 38 (NY: Religious Research Association, 1996), 159-174.
by Bob Whitesel D.Min., Ph.D., 11/26/17. This is another video introduction I’ve recorded for my colleagues, students and clients regarding how to prevent group exit. Students may find this video helpful in understanding their homework on the topic. by James Sudakow, Inc. Magazine, 1/24/17. Find the people who are dead set against the change you are trying to lead, and go get them involved in it. It sounds counter-intuitive. Why would you actually seek out the people who want you to fail or who are actively, or frequently passive aggressively, lobbying against you? Why would you put them on the core team who is leading the change? Isn’t that kind of like sabotaging yourself? 1. They will tell you all of the reasons (that you don’t want to hear) about why people don’t want to, or can’t, make the change a reality. That information is really important. Not only does it help you understand why people may resist so you can think about how to handle it, but it also forces you to confront potentially legitimate flaws in the change you are trying to make or blind spots in your thinking. Whether you like it or not, you will be forced to hear perspectives counter to your own about the change. 2. If you find a way to work with them towards a solution they support, they will become your biggest advocates in selling the change. There’s an old expression that says that “nobody is more zealous than a convert.” If you can truly find a way to collaborate with the objectors and find a solution they can support, they will sell the change enthusiastically. A lot of the objectors are quite influential across the company.